Single-stage laparoscopic sleeve gastrectomy (LSG) may represent an additional surgical option for morbid obesity. We performed a retrospective review of a prospectively maintained database of LSG performed from November 2004 to April 2007 as a one-stage primary restrictive procedure. One hundred forty-eight LSGs were performed as primary procedures for weight loss. The mean patient age was 42 years (range, 13–79), mean body mass index of 43.4 kg/m2 (range, 35–75), mean operative time of 60 min (range, 58–190), and mean blood loss of 60 ml (range, 0–300). One hundred forty-seven procedures (99.3%) were completed laparoscopically, with a mean hospital stay of 2.7 days (range, 2–25). A 2.7% major complication rate was observed with four events in three patients and no deaths. Four patients required readmission; mild dehydration in two, choledocholithiasis in one, and a gastric sleeve stricture in one. 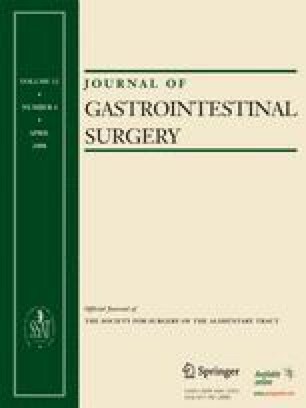 Laparoscopic SG is a safe one-stage restrictive technique as a primary procedure for weight loss in the morbidly obese with an acceptable operative time, intraoperative blood loss, and perioperative complication rate. This work was presented at the SSAT Poster Presentation session on May 21st 2007 at the SSAT Annual Meeting at Digestive Disease Week, Washington. Poster ID M1588.